This kitchen has all the elements that would define a complete and perfect contemporary kitchen design with a great deal of aesthetic sense in it. 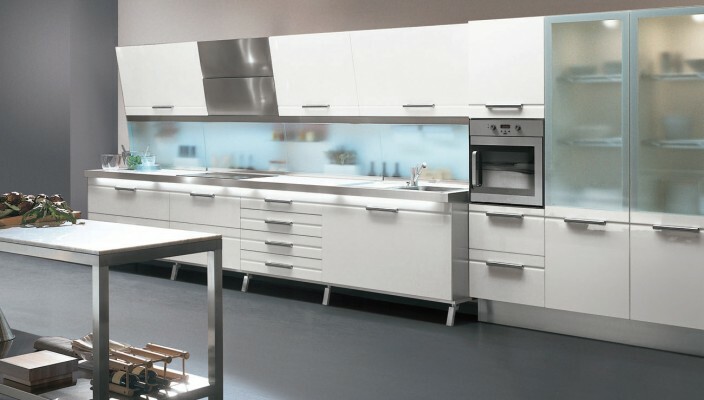 The white color scheme used in the modern-looking cabinets in the kitchen defines one of the most noble and sober color pattern used in kitchens. The kitchen is equipped with all modern day equipment’s and appliances which are carefully arranged in the available space. Apart from the cabinet, there have been shelves provided in the cooking area for further storage and it also helps in the additional beauty. The ambience that has been created by the white and grayish color schemes is highly sophisticated, yet top-class. To add to the beauty of the whole kitchen setting, a table (non – wooden) has been placed in the kitchen so that the kitchen may be complete and loaded with all the facilities that you could require anytime while you are in the kitchen.